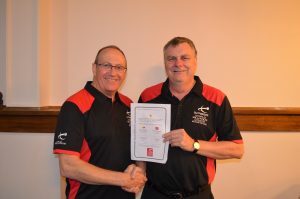 Gary qualified as a WPBSA World Billiards Coach and Examiner in September 2017 (awaiting WPBSA approval). He took up billiards at the age of 18 but had periods away from the sport of 6 & 7 years and has only played seriously since 1998. Gary has won multiple New Zealand Billiard Championships, well over 70 ranking titles within NZ and has over 500 century+ breaks in competition. Gary has been to 6 World Championships making the last 16 three times. Although now getting to the end of his playing days, his passion for the game means he is still trying to improve his play and wants to implant his knowledge to others within the sport. Gary has held Billiard Academies within NZ to try to lift the standard of players and promotes the game as much as possible despite the perception of it being a dying sport. As we all know youth is the answer – us oldies can’t keep playing forever! NZ Billiards Champion 2003-13, 2015.